Friday’s are usually political post, often new bills being introduced at the Board of Aldermen that day. Those will resume when the 2019-20 session begins next week. Today’s post is a look at a wealthy St. Louis family, what’s left of the street & park named after them. 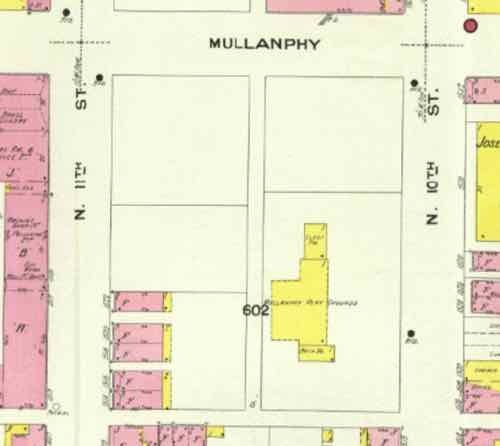 Mullanphy Street was named either for John Mullanphy or his only son, Bryan Mullanphy. My guess is the street was named after the father as it was platted prior to 1841. At the southwest corner of Mullanphy Street & 10th Street was Mullanphy Playground, later Mullanphy Park. This, I think, was named after the son who had served as mayor and died at only 41. 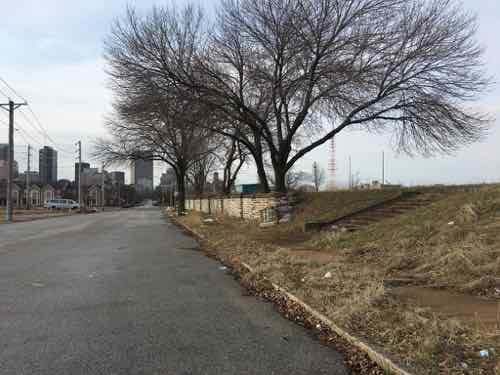 An opportunity exists for the establishment of a civic center, adequate for the present needs of this district, in conjunction with the municipal playground at Tenth and Mullanphy Streets. 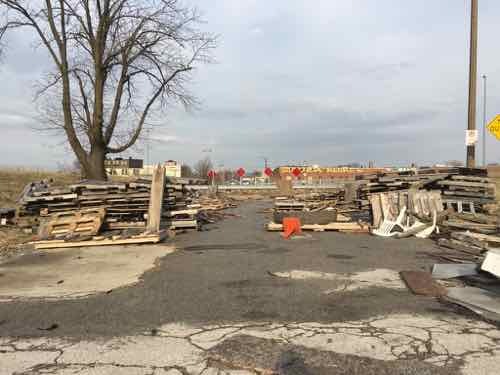 The property extending along the Mullanphy Street front of the playground from Tenth to Eleventh Streets, and now under lease by the municipality, should be purchased by the city. It should also purchase the small lot on Tenth Street, now under lease, and the houses on Eleventh Street, now owned by the Mullanphy Board. In these houses there should be established a gymnasium and public bathhouse, a branch reading room of the Public Library and a hall for public meetings. The playground could then be enlarged by dirt tilling and by the removal of the present temporary library and bath buildings to the permanent quarters. The October 1909 Sanborn Fire Insurance map shows the playground hadn’t yet been expanded. Sanborn Fire Insurance map, October 1909. Sheet 015, Volume Three. The houses on 11th remain, block 602 is divided into multiple parcels. Looking at historic aerials going back to 1955 it appears a large building replaced the residential buildings. The gymnasium? Whatever it was, by 1968 the building was gone. The old aerials showed the steps up to the elevated level field of the park. I recall walking, biking, driving past this park in the early 90s when I lived nearby in Old North St. Louis. As 10th was a one-way street to exit I-70 to reach downtown, many people drove past this park for decades. People still drive past it, but on the other side. 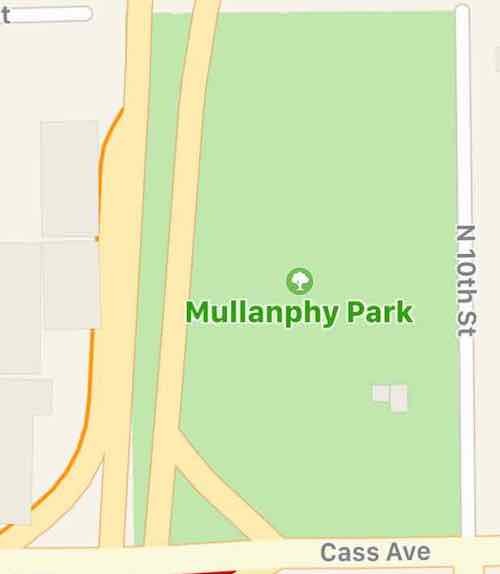 Apple Maps still shows Mullanphy Park, though it never extended to Cass Ave. 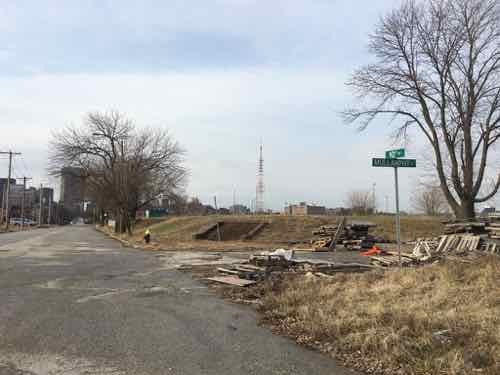 Looking west on Mullanphy Street from 10th, it’s blocked by the on/off ramps for the Stan Musial Veterans Memorial Bridge that opened 5 years ago. Looking south toward Cass Ave. you can see the corner steps up to the field that’s higher than the sidewalk. Closer we see steps off 10th Street and an old stone retaining wall. 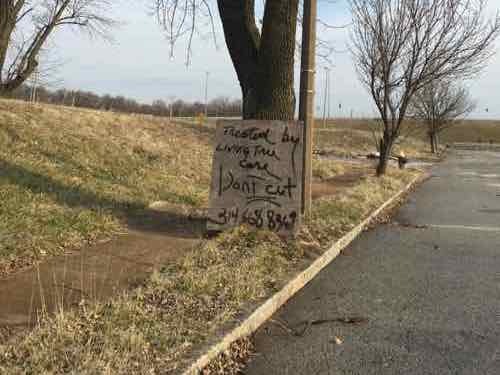 A sign next to a tree asks that it not be cut down, that someone is caring for the old tree. This once-important neighborhood park is now owned by one of Paul McKee’s Northside entities. The surrounding neighborhood hasn’t existed for decades and the west side if now a massive on/off ramp.